Review by Mudderducker on 6/9/2014. Simply 'Spectacular' I can honestly say this is going to be one of my favourite maps, for many reasons: design is appealing, territories are super well done, ideas into the map are superb and the big cities make it a top quality map. This map will be successful, if it could reach the popularity of yours :-) I am not sure if I keep the Egyptian Bonus as large. May be it'll be changed. Let's see what further matches telling about. Thanks for your close look at! Your opinion is always welcome! Review by NinjaNic on 6/9/2014. This map looks really cool. I love the idea where you can conquer a whole city instead of just having 1 territory. A review like this is worth 6/5, if it was made by an Top-Map-Creator like you are! Review by Nathan on 6/10/2014. Wow. Just wow. This map is beautiful, incredible and epic. I didn't even find any missing connections, which is astounding in a map with 1,500 territories. My only suggestion would be to use smaller, more manageable bonus areas, preferably with 10 or fewer territories to a bonus area. Review by Cyssoo on 6/13/2014. Review by Varana on 8/27/2014. Very impressive, very big, very many good ideas in it. But gameplay feels like being a viking: The beginning of the game is a coastal race from harbour to harbour, gaining 1 income per attack. This income system would be great for a viking map. 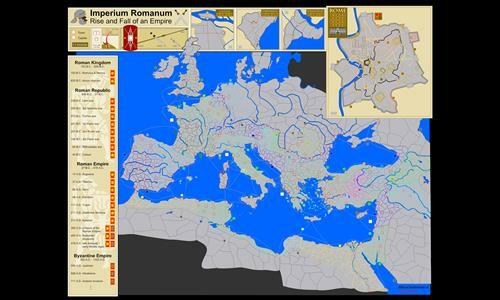 Being a roman empire map, either land should generate more income (double) or there should be ships on the routes, slowing down the movement on sea. Review by [ROME] Arsenic1118 on 6/10/2014. This is a very enjoyable map. It is great for FFA's and team games. Vitrix Mortalis loves it and so do I. Thank you, Vitrix Mortalis for the perfect cooperative work! Review by Krulle on 6/20/2014. -I personally find the Egypt bonus okay. The amount of small city bonuses is far more important anyway. You could divide Egypt into the ancient (pre-roman) North-Egypt and South-Egypt, if you really want. Review by SC0TTIUS on 6/9/2014. Review by Le Count H on 6/13/2014. Review by WolfMan on 6/19/2014. Review by Mark The Destroyer on 7/4/2014. Truly an epic map. Well done. Review by okasan on 7/8/2014. A fantastic map, with a lot of thought (and wit) having gone into it. For single players, it has been noted before, not much of a challenge sadly, as the AI behaves rather oddly and once the port cities have been conquered, by about move 15, the game is effectively over and all that's left is "where is the AI hiding". Tip: against six AIs the game is a bit more challenging, though it remains the only mega map where conquering all or nearly all countries is not a necessity at all. Review by cinereaste on 11/25/2014. Error: Taulani and Buthrotum are linked, but shouldn't be, according to the visuals. Overall, very nice map! Interesting geography, beautifully done. Review by newingot on 7/3/2015. Very good map! It's very finely drawn and makes the spirit of old IMPERIVMROMANVM and surrounding places! Too bad that it doesn't show entire Mesopotamia but that's fine because that province was for 1 year. Not important. Review by Craig Hepler on 6/24/2014. I liked the mix of regional battles and the city battles in this map. Review by Purge on 8/11/2014. Review by You're_A_Real_Wizard on 9/7/2014. Review by dununfola on 9/30/2014. I love how the bonus system on this map completely transforms gameplay, making it almost historically accurate. Review by Athalel on 10/18/2014. Review by Damion Strife on 10/26/2014. Grate large map. Loved the layout, and the army bonuses weren't so high that it gets out of control. Impressive eye for history. Review by searingmage on 11/22/2014. Very intricate - perhaps a little too intricate - but highly enjoyable, if extremely long. Review by Njugu on 3/8/2015. The only reason for 4 stars is that the AI seems to play really weirdly on this map. Otherwise this is a really good map with lots of original ideas. I suspect this map will turn out to be a LOT more fun with 5 or 6 hooman players! Review by acroteknon on 11/24/2015. A real nice map, accurate, lots of work by whoever made it, congratulations. You need to sit back since turns take a while to complete. Review by Guardian3348 on 11/27/2015. I love this map, it is my favourite. I also love the Roman timeline on the left hand side. 10/10, love it!! Review by nickbenatar on 12/24/2015. Really detailed and fun, with its own unique twists. I really enjoyed it. Review by ViralGoat on 3/14/2016. Review by DontAttackMe on 3/15/2016. one of the best maps. Review by (( Legio X Equestris )) - Ion on 11/7/2016. BEST MAP OF ALL TIME! Review by Andalorium on 12/24/2016. Love the map, and the detail, it almost feels like I'm playing a different strategy game other than Warlight, impressive. Review by Peacemark on 11/4/2014. Review by Shawn Smith on 3/5/2015. Review by Frankdermofo on 3/28/2015. Review by lucaloddo on 5/10/2015. Review by Neil Hasiba Emir Avdiić on 5/12/2015. Review by BigZZZ on 12/1/2015. Review by Roman Belokopytov on 12/1/2015. Review by hdggDalton on 11/16/2016. Review by A_B3 on 1/17/2018. A great older map. A good play. Review by OTPM on 11/18/2014. The bonus structure is hard to understand, especially from mobile. Review by intelligentbox on 4/20/2016. Review by kinggo5 on 8/25/2017. Good for a fun, interesting and long game. Review by krby71 on 9/7/2017. Review by UnkonwnSoul on 5/31/2018. you need an undeacent amount of hours to get this done, if you succeed at all. Review by OgreZed on 4/9/2018. Love this map. I just wish the AI players didn't peter out during a single-player game. They seem to stop expanding their territories. Review by Keith on 1/18/2019. Review by lotsofus on 12/25/2018. Review by slimjim2 on 4/6/2017. Review by Weaselbee on 6/23/2014. 4 stars. takes waaaaaaay too long to find the last person in a ffa. Review by BasilBerylium on 6/14/2014. Hello, you can add at least other smalls tribes how the barbarians in map? Nearly every Territory have the name of a tribe who lived there (or near by). Review by Andrea Buldrini on 8/19/2014. Review by elpibe1010 on 2/14/2015. Review by Gen.Michels on 4/21/2015. Review by mondodoro on 5/23/2015. Review by shekel finder on 7/20/2015. Review by mlew on 6/29/2014. Review by Brandon Quinn on 4/14/2015. Review by leandros on 6/21/2014. 1 out of 13 people found this review helpful. Review by Vtglc on 6/11/2014. 3 out of 23 people found this review helpful.